It has been encouraging over the past couple of decades to see many suburbs begin to transform from car-dependent, land-use-segregated enclaves to more compact neighborhoods that promote walking, cycling and a mix of uses. However, our towns and cities remain surrounded by many areas hosting light industry, which under-utilize adjacent infrastructure, turn their backs on nearby neighborhoods and fail to meet the growing interest in health and wellbeing. Yet these island-like, unsustainable and amenity-deprived areas can be catalysts for innovative ways to address changing workplace expectations, logistics consolidation, sustainable urban systems — heat island mitigation, multi-modal connectivity, responsible water usage — and housing affordability. The ambition is not to displace industry but to introduce a mix of uses that will not only co-exist with it, but also benefit local industry and workers. 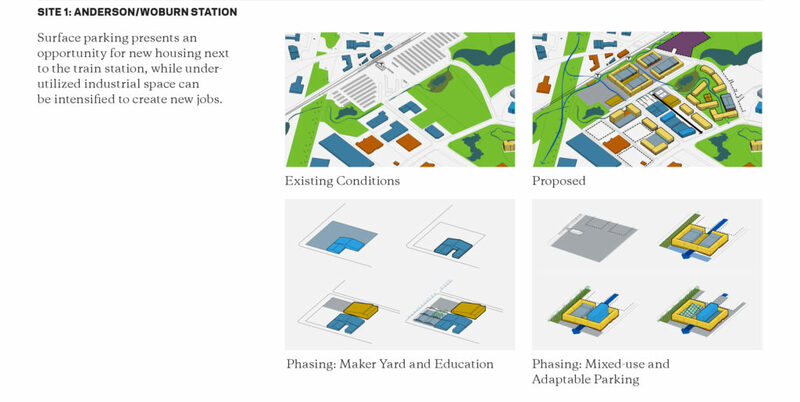 NBBJ researched one of these typical sub-urban areas to explore how it might be transformed, as a prototype for future developments in similar areas. 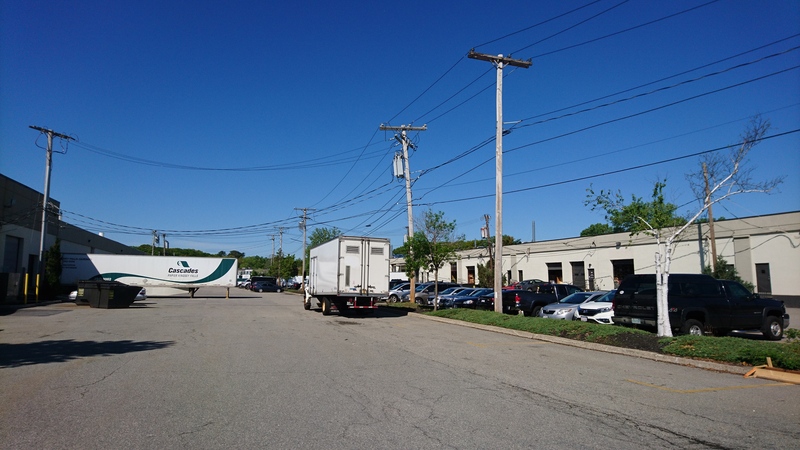 We selected Woburn, Massachusetts, less than 20 miles from Boston, for its close proximity to regional public transport, adjacency of light industrial and residential uses, evidence of natural systems, and clear lack of amenities and services. 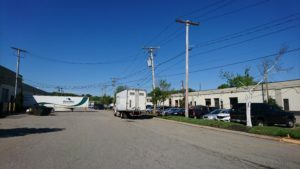 The industrial park in Woburn, bounded by Interstates 93 and 95 and straddling the rail line that serves Anderson/Woburn station, typifies the conditions of the low-density, light industrial suburb. Our goal was to explore and demonstrate how this area can be retrofitted such that it will support a walkable, cyclable environment that supports living, working and recreation, and takes advantage of its close proximity to the train station. In particular we focused on opportunities to connect with natural systems and exploit their potential as a connected and civic realm. 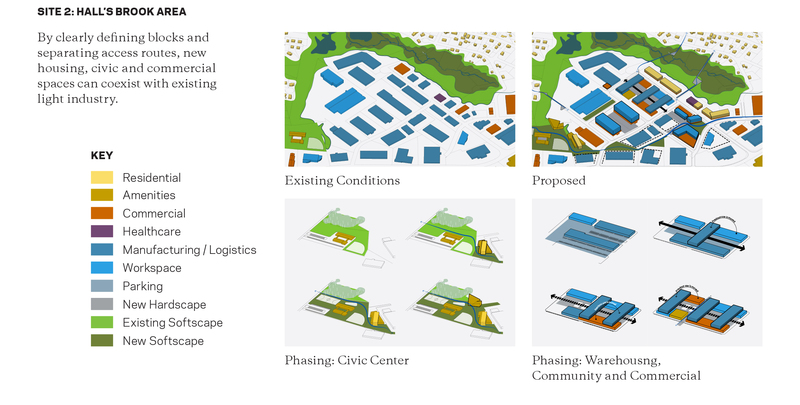 The ambition of the project was to propose a prototypical spatial approach to retrofitting under-performing or soon-to-be-redundant light industrial areas, recognizing the socioeconomic implications of any proposed interventions. 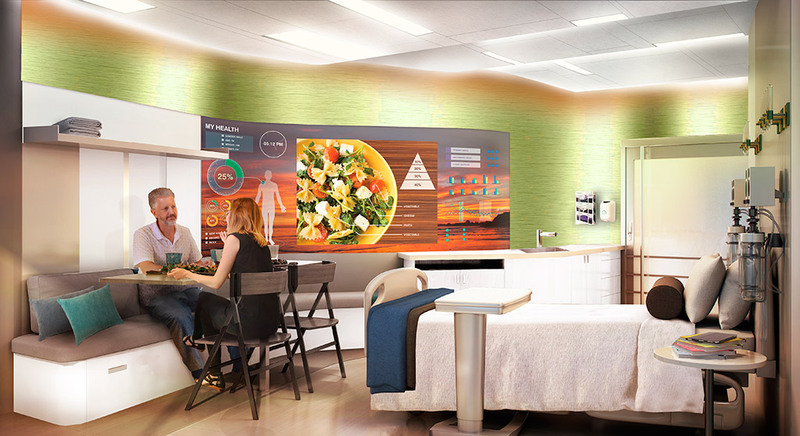 Critical to the study was the retention of light industry or potential for new manufacturing, research and biotech labs to co-exist with a mix of uses. As manufacturing and warehousing businesses compete for workers, being located in a context that offers amenities and services will increase their attractiveness. We first conducted research to gain an understanding of Woburn as it compares to other towns in the region in local demographics and employment. Then, through a combination of on-site observation and informed conjecture, we considered rail usage and audited the businesses that occupy the site to gain an understanding of their logistics requirements. a. Integrate residential, civic, and commercial uses with pedestrian and green links. Pedestrian pathways and natural systems provide fluid connections between neighboring residential and commercial areas. Community uses like recreation fields, a senior center, multi-family housing, a civic center or library can provide transitions between commercial and industrial areas and residential areas. Similarly, the forging of a bicycle and pedestrian network connecting places of business to the commuter rail station provides modal choice for both workers and residents. b. Use natural systems and materials to ensure the transformed industrial park is, indeed, more park-like and environmentally sustainable. Reimagine storm water infrastructure as a green amenity; mitigate heat islands through tree-planting and white, blue or green roofs. Sports fields and parkland serve local employees before or after work or at midday. Culverts, drainage systems and tree canopies should be seen as part of a cohesive natural and ecological systems network that links to and, where possible, provides green amenities with both recreational and connectivity benefits. a. Integrate and expand community-facing uses into existing or former industrial buildings. Industrial buildings can include community amenities by incorporating related public-facing spaces and programming, such as convenience stores, F&B establishments or pop-ups that relate to the manufacturing/commercial activity. Capitalize on existing community-serving assets such as healthcare, education, daycare facilities, recreational facilities and gymnasiums by expanding their footprint and influence to contribute to active street-facing frontage and green/blue open space. b. Identify opportunities to intensify with diverse residential types and development models. Provide residential choice, with a use mix and flexibility reflective of today’s needs, in order to address living and work space affordability and retain and attract a younger population that will lay down roots. a. Intensify the existing built form and open space. Add frontages onto buildings with large setbacks to activate streets. Define blocks to create separated routes, concentrating logistics routes and servicing on the interior of blocks. Stack storage vertically to open up building frontages for more active uses. b. Catalyze adjacent densification through corridor improvements. Creating welcoming streets —generous sidewalks, tree canopies to mitigate heat islands, street lighting — will catalyze densification on adjacent blocks. Increased foot traffic and decreased car and truck speeds will encourage new development and more street-facing uses. There are few relevant precedents that attempt to intensify uses at the scale of an industrial district with the same qualities as our case study AND attempt to integrate residential. Similar projects are those that strive for a complete area-wide rebranding and reconfiguration to create an innovation district — a trend sweeping across Western cities that, encouragingly, recognizes that the lines between different activities are blurring. The Netherlands has been quite progressive in redeveloping industrial districts while allowing for the coexistence of manufacturing and housing, often focused around a single repurposed large-scale building that acts as a catalyst for wider redevelopment. Econinnovation District (Uptown Oakland, Pittsburgh) presents a slightly different context from Woburn, as some residential and commercial exists in a site area characterized by surface parking lots and derelict buildings. However, the initiative is promoting rezoning to allow for a mix of research and work space, housing and community uses. INIT (Amsterdam) is a multi-company building in the inner-city Oostenburgereiland, a former industrial area. INIT, housing meeting rooms, auditorium, fitness center, restaurant, childcare, exhibition and cultural space, is expected to catalyze the redevelopment of the industrial district and the renewal of a 19th-century neighborhood with housing, offices, culture, leisure, hotel and new bridges. Being situated near to a waterfront is obviously an asset. Buiksloterham (Amsterdam) demonstrates how an existing industrial area can be intensified and transformed into a mixed-use area containing light industry, offices, culture and housing. The city is promoting an emphasis on sustainability and the circular economy, and (acknowledging that these types of sites are opportunities for diverse development models) self-builders are invited to build their own houses. Again, this site is situated on a waterfront, undoubtedly increasing its attraction. Northside Studios (Andrews Road, London) accommodates five double-story light industrial units with on street lay-by access and a tight rear vehicular access. The 10 residential units above are set back from the road, minimizing the visual impact of activity associated with the industrial units below and creating a generous terrace. The units are adequate for many businesses, although they will be of limited use for noisy businesses or noxious operations. The BDM Logistics Management (Royal Albert Basin, London) warehouse component left a plot available for residential development along a blank facade. Separate industrial access routes will be maintained with yard space on the opposite side from residential development, so the warehouse itself will shield noise from truck movements. The administrative elements of the BDM building are to be placed to bring human-scale activity along the street elevation. 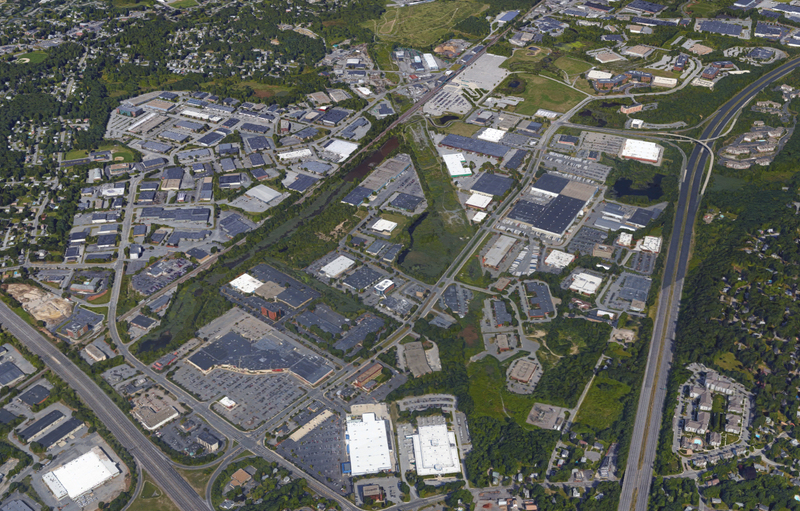 The suburbs are abundant with places similar to the study area in Woburn — nearby to commuter transportation and employment hubs, developed in an environmentally unsustainable manner, transforming in their industrial needs, with residential neighborhoods in close proximity and natural systems untapped as a connective resource. These are areas of opportunity, places that can cater to middle- and lower-middle-income households. Similarly, these suburban areas can offer affordable, diverse and flexible workspace — from makers’ spaces to biotech labs to healthcare and learning space — as businesses and institutions, like residents, are priced out of many cities. It is paramount that we continue to explore typologies and neighborhood structures that allow light industry, workspace, housing and community infrastructure to co-exist in a mutually beneficial way. All images courtesy NBBJ, except aerial courtesy Google Maps. Editor’s Note: This interview was originally conducted for the December 2018 issue of A+U. It has been condensed and is reprinted here with the permission of the publisher. A+U: How do you create “community” in design? Jonathan: I’ve often talked about the idea of exploding or deconstructing typologies. The most obvious example is the high-rise tower, which is the most anti-community building, certainly in its symbolism but, more importantly, in its space and organization. That typology literally has to change in order to make a place that’s appropriate for people to interact naturally. The more we can think about peeling it apart and putting it back together in a different way, still having in mind the resources that go into building and maintaining high-rises, the better. Tencent’s Seafront Tower is a great example. Tencent’s business connects people through the digital world, whether it’s WeChat, QQ or the Tencent Cloud. 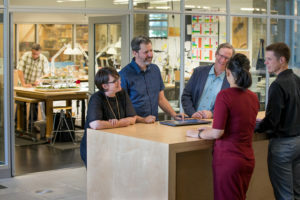 You quickly realize that the traditional building doesn’t match what they do in their business, it doesn’t align with where social connectivity is going, so we had to rewire the building to get closer to matching what they do in the world with their business, their product and the people who make the product. Our thinking was first to take the campus concept, with its spread-out, low-rise, multi-building approach, and apply it to a high-rise. Then we determined we needed to deconstruct the high-rise into two towers and bring social elements into connecting bridges. We also reprogrammed the elevator system to get more active participation and cross-collaboration. Vivian: At the end of the day, we’re striving to find meaning. We want to help our clients find meaning in why they go to work every day, how they do the best work. You can imagine that meaning can be very diverse, so, in a building, you cannot have one solution. That’s one reason we always try for what’s next. Imagine the next generation of clients who started their careers working in buildings such as Tencent and Amazon. They’re changing too, so it’s cyclical: in the not-too-distant future, we and our clients can reciprocally drive each other’s creativity. A+U: What role can new technology — like Rhino or augmented reality — play in defining community? Steve: We have an obligation to our clients to mitigate risk while we push boundaries to unlock potential. We talk a lot about the realization of beauty and performance: we live in an era where computing is transforming our ability to demystify performance and quantify value, so we have the opportunity to leverage data analytics and computing to measure and anticipate performance in ways that go way beyond the intuition of the designer. Especially interesting is our ability to point our digital tools at elevating human performance and community-making at all scales. Jonathan: We’re at a point right now where we have both traditional methods of design thinking and technology-driven methods of design thinking, which are working hand-in-hand, though sometimes one supersedes the other. I’m curious, if you looked out 5, 10, even 20 years, what do we see as the future of technology, and how will it affect the design process or design thinking? Nate: I see the digital and physical blending a lot more. The distinction between the building and the building system is going to go away. When we design, the question of what is the “tool” versus what is the “model” and where is the “information” — all that is becoming obsolete. We’re heading to a place of rapidly going from a sketch on a piece of paper to a BIM model, and that will only continue to speed up. We have VR labs, but this is a temporary solution while the hardware catches up to where we’re practicing. 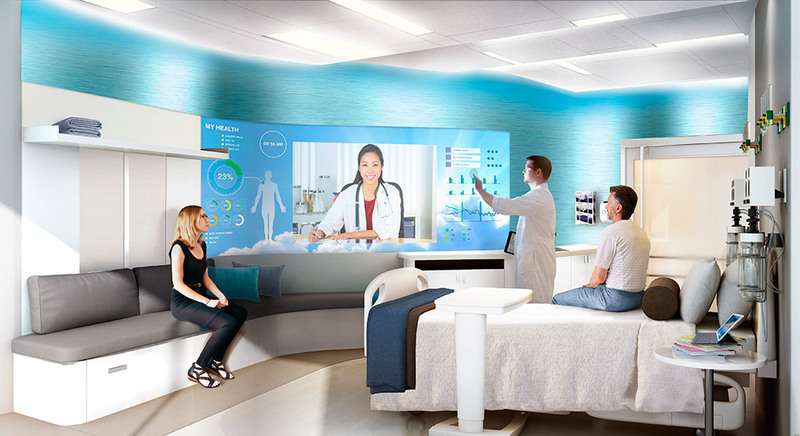 We’re going to be seeing these things, if not fully embedded in our minds, at least on some sort of a screen that’s always with us, always mapped to the world. We’re going to be completely augmented in our design abilities. And architecture will either have to become much longer-lasting or much shorter-lasting. Our needs are changing so rapidly that buildings will be either infinitely repositionable or rapidly torn down and recycled — a new method of deconstructing that’s not wasteful. There’ll be 100-year projects or five-year projects, and fewer projects in between. Alyson: We design to a finite program now, but in the future we’ll design buildings that are program-less, that will allow occupants to impose their own structure for what they need out of spaces. I see the beginnings of that in the Columbus Metropolitan Library. They had a set program for organizing their daily activities, and our job, of course, was to craft a space to facilitate those activities, but there’s a freedom within the building for users to occupy it in the ways that they see fit. There’s an overarching program in all the library’s branches, but the user determines what’s needed on a daily basis. Jonathan: The best buildings, still, from 100-plus years ago are the ones that are program-less. They are these beautiful shells that can be fairly quickly transformed from one thing to the other. A+U: What is the role demanded of architects today? Jonathan: It’s complicated, because on one end of the spectrum are people who say form and space is a decoration at the end of a functional process. At the other end of the spectrum are others who say form and space is a spatial experience — that it’s everything. Those are the two poles, and they have been fairly strong for centuries. Our challenge is to be in this interesting intersection, so that the functionality and the experiential thinking crosses over with the bold formalistic thinking, and they’re pushing each other. Steve: The profession has to dramatically expand its definition of the possibilities that are inherent in architecture and urbanism, relative to the health of our planet and to the potential of society. What drives our practice is a central belief in the role that design has in solving really difficult problems and in protecting what is human. For us, it is about opening up possibilities and an exchange of ideas that resolve in a synthesis that’s beautiful, that’s provocative, and that advances the art and science of the built environment.